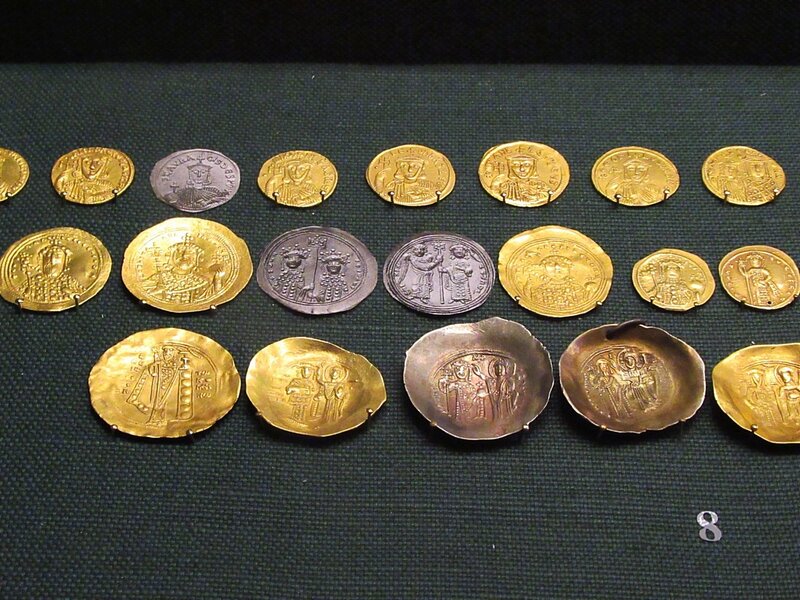 Above: coins from the Byzantine & Christian Museum in Athens, Greece. Economics has often been called the dismal science. I’m not sure it is a science so much as wishful thinking, especially when it comes to the predictions economists make. However, my day job is in the finance industry and economics a topic often discussed. Inevitably, given my deep interest in the Byzantines, I began to contemplate the changes in the empire’s condition in the 11th century and how fiscal mismanagement led to military disaster, which led to fiscal catastrophe. I was aided in this contemplation by a tidy book, The Byzantine Economy, by Angeliki E. Laiou and Cecile Morrisson (Cambridge Medieval Textbooks, 2007). Anyone who has been following my blogs for long will know my feelings about the Emperor Constantine IX Monomachos. The man was a spendthrift as the contemporary historians Michael Psellus, John Skylitzes and Michael Attaleiates all separately attested. His spending focused on showering money and gifts on his favorites, and those whose support he needed to stay firmly seated on the throne. The historical record also reports that he spent inordinately on many new buildings in the city, especially the Church of St. George Mangana and its ancillary buildings (palace, hospital, old age home for soldiers). In fact, he started the church of St. George and half-way through construction found it insufficiently grand, so tore it down and built an even more magnificent structure. One unquestioned way he dealt with the situation was to devalue the gold nomisma, a coin that had been the gold standard (the “bezant”) throughout the world for centuries with their gold content between 90% and 98%. Bezants have been found as far east as Japan and as far north as Scandinavia, a testament to how well they were prized. Constantine IX died in January 1055 after 13 years on the throne. A chart on page 154 of The Byzantine Economy provides insight into what happened to the gold content of the nomisma (also called solidus) which fell first to between 80-90% gold, before slipping down to just above 70% in the 1050’s. As I have mentioned in previous blogs, there were many vanity projects built during his reign, the cost of which necessitated cutbacks in military funding, especially in the empire’s borderlands. The immediate impact on the empire was negligible, but it grew over time as enemies – Pechenegs, Normans, and Turks – realized what was happening to Byzantine military readiness and took advantage of it. Over the next sixteen years, the nomisma’s value held steady in the 70% range of gold content. All that changed in 1071 with the devastating effects of the Battle of Manzikert. Manzikert was a battle the empire had the manpower to win and would have won but for the lethal political battles in Constantinople. I have written about the terrible consequences of “take no prisoners” politics in that (or any) time in earlier blogs. Suffice it to say that the empire was defeated by the Seljuk Turks who soon swarmed throughout Anatolia, taking control of this rich territory. The empire lost tax revenues and the products that came from these lands – horses, food, mine products, etc. Almost immediately the value of the gold nomisma began falling, dropping almost half to 40% gold content by the end of that decade. There were similar devaluations of the empire’s silver coins done in the same years. The nickname of Emperor Michael VII Ducas from that time, “Parapinakes”, which means “minus a quarter”, was generous compared to what had actually occurred to the currency. Michael VII Ducas was unusually poorly suited to being a ruler and by 1079 he had abdicated and taken himself off to a monastery. 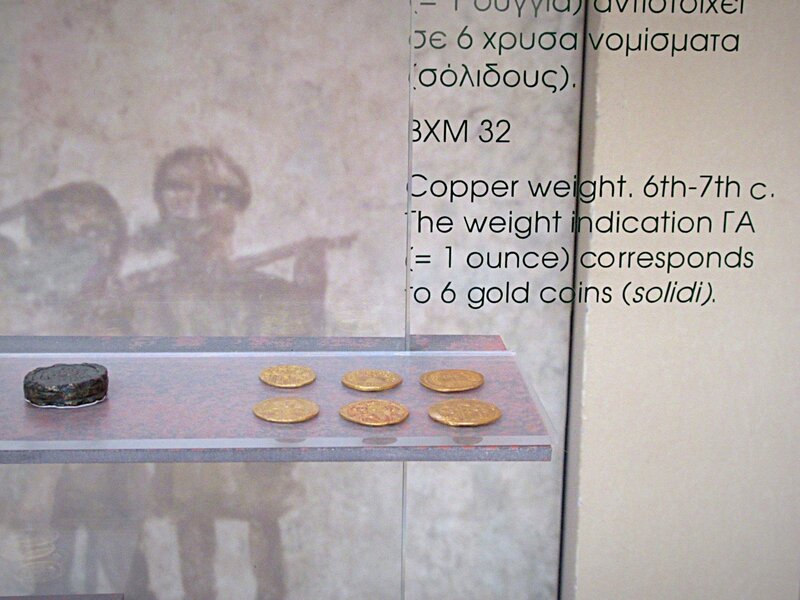 Above is a photo I took at the Byzantine & Christian Museum in Athens of a copper weight that was used by merchants to verify that the amount of gold in the coins corresponded to the price their customer was to pay – the above weight was equal to the weight of six gold coins or one ounce of gold. It was not uncommon in the Middle Ages for coins to have pieces of their precious metal shaved or cut off, so these weights were critical for any merchant who wanted to stay in business. This system of weights meant that merchants would have quickly realized when the newest coins did not contain the same amount of gold as the previous coins did, even if their appearance may have been similar to the existing coins. Historians of that period knew little about economics and made few comments about fiscal matters, but the effects of the devaluation of the currency would have had an immediate affect on the populace, and a long-term impact on the prestige of the empire. The value of the Byzantine currency fluctuated in later years, but never again reached a 90% gold content, and neither did the empire ever return to the same level of strength in enjoyed prior to the reign of Constantine IX Monomachos. A sad demonstration of how quickly the fortunes of a great empire can turn when ruled by incompetents.